MAISPA have put below some tips for choosing tiles for your home. For more specific advice, why not also read our choosing a bathroom tile (see bottom of Blog.) and choosing a kitchen tile (see bottom of Blog.). Choose light colors to make a small/dark room feel bigger and brighter. However, don’t be afraid of color, which can also create some unique effects and environments in your home. Personal preference is the key. Choose a tile grout color that compliments your tiles to help blend in grout lines. Need floor tiles? Make sure you check that the floor tile type(See bottom of Blog) is suitable for your intended area/use. A similar question you may need to ask is do you need ceramic or porcelain tiles? Porcelain tiles are suitable for outdoors and domestic floors where heavy traffic/abrasion is anticipated. See bottom of Blog for more details. is the most popular room in a domestic home to find tiles. This is largely down to the hygienic and water resistant solutions they have compared to wallpaper, carpets and most paints. In addition, tiles can add potential value to a bathroom and offer some unique finishes which can’t be matched by other materials. Bathrooms can accommodate all types of tiles whether they are ceramic or porcelain, travertine or slate. Ultimately, personal preference is key, however the tips below will help you narrow down your choices and assist you to choose the right tile for your bathroom. Bathrooms need to be a place of hygiene, which tiles can certainly offer. With their ‘fresh’ appearance and ‘easy wipe’ surfaces, hygiene is one of the first things that come to mind when using tiles in the bathroom. Although tiles are water resistant, they aren’t totally waterproof. One very important piece of advice for shower areas is that you waterproof the shower area prior to tiling with a waterproofing kit. These inexpensive kits will prevent any potential water damage to the walls behind the tiling. Furthermore, If you choose natural stone tiles for your bathroom, ensure they are sealed with the advised maintenance products prior to fixing to prevent water damage/staining. Our advice is to avoid using large bathroom tiles (e.g. 60x30cm) in a small bathroom, as they will dwarf the room significantly. Although this is true for some cases, if the majority of the tiles can be applied without any cuts, the end result can be very impressive. Although small tiles (e.g. 10x10cm) can look good in smaller bathrooms, the many grout lines (compared to using bigger tiles) can sometimes give an unappealing effect. Consequently, many people choose medium sized tiles (e.g. 40x20cm), which are a common choice for large and small bathrooms today. You should also take note of the spacing between your washbasin, toilet, windows, etc. If the spacing is very compact, small tiles may be the better option, as they will ‘flow’ better than larger tiles and require less of a cut. Light colored bathroom tiles (i.e. white or cream) can make small bathrooms look bigger as they reflect the light more than darker colors, giving an airy and spacious feel to your bathroom. Using the same color wall tiles as the floor tiles can also give your bathroom a spacious effect. To enhance the effect, you could use a similar colored grout with the tiles or purchase rectified tiles that allow tiles to be fixed closer together. In general, tiles actually retain heat so they shouldn’t feel cold on your feet; however it can often depend on the surface underneath the tiles. For example, tiling onto wood (which can ‘breath’) will create a warmer feel than tiles that are placed on top of concrete. Under tile heating is a modern solution to warming floors and entire rooms. There are many benefits to under tile heating such as giving you more wall space (no need for radiators), low running costs, and a more efficient way of heating a room (compared to a radiator). Today, tiles are found in the majority of domestic kitchens, ranging from small splash back features behind hobs and sinks, to full kitchen floors, for modern kitchens to have tiles fixed from floor to ceiling, offering a very stylish and modern effect is very popular. For very small kitchens, you should consider small floor tiles (e.g. 300x300mm) to create a good flow. Larger format tiles (e.g. 500x500mm and greater) look best in kitchens that have a lot of floor space where many tiles can be laid without cuts. Large floors also welcome ‘multi-format’ tiles – tiles of the same design that are laid in 2, 3 or 4 different sizes (as a continuous pattern). For cooker splash-backs and areas between cupboards and work surfaces, small kitchen tiles (e.g. 100x100mm) are often the popular choice. However, over the last few years (and certainly in today’s market), mosaic tiles are also a common choice. If you are looking to tile full walls from floor to ceiling, both small and large format tiles can work, however, only choose larger format tiles (e.g. 400x200mm) if you can apply the majority of the tiles without cuts. Kitchens need to be a place of hygiene, which tiles certainly offer. With their ‘fresh’ appearance and ‘easy wipe’ surfaces, hygiene is one of the first things that come to mind when using tiles in the kitchen. Hygiene is also escalated when grouts with antibacterial additives are used in food preparation areas, which prevents the growth of bacteria such as E. coli and Salmonella. The kitchen is perhaps the most frequently used room in any house, often being an entrance to the garden, sleeping areas for pets and storage for heavy domestic appliances. 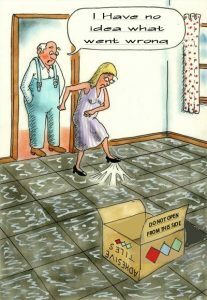 For this reason, it is important to choose a floor tile that is hard wearing. Porcelain tiles are often a good choice for kitchen floors as the tile is the same color all the way through, therefore accidental scratches/chips aren’t noticeable. Natural stone tiles (travertine, slate, marble, etc) are becoming a popular choice as they can offer fantastic and unique effects. Due to the popularity of natural stone, tile manufacturers are starting to produce ceramic/porcelain tiles with designs that replicate natural stone. Emphasis should be made on ‘personal choice’ for this answer. However, always consider the color of your kitchen units and surroundings when choosing the color/design for your tiles. Depending on the look you are after, warm looking colors such as creams and terracotta can contribute to creating an impression of warmth. However, don’t disregard other colors, which can offer some very stylish and modern finishes. A common dilemma when it comes to choosing tiles is whether to pick ceramic or porcelain. What is the difference? Which do I need? Is one better than the other? These are questions we get asked regularly so let us take away any doubts and answer them for you. Although they look the same, the main difference between ceramic and porcelain tiles is that a porcelain tile is denser and less porous than a ceramic tile. In simple terms this means a porcelain tile is much more hard wearing and suitable for both indoor and outdoor use, the extra density is a result of a slightly different manufacturing process. Whilst ceramic tiles are only recommended for interior walls and floors, porcelain tiles are a more popular choice for floors that anticipate heavier traffic; we’re talking kitchen floors, hallways and commercial applications as they are increasingly resistant to scratching and chipping. There are two types of porcelain tiles – through-body porcelain and glazed porcelain. Through-body porcelain is where the tile has no glaze so the color/design is the same all the way through so if there was any wear or chips to the tile it’d be very difficult to see. Glazed porcelain is where the tile has been manufactured with a glaze applied to the tile face. In this case the body of the tile is just as hard wearing as a through body porcelain however the glaze has the same characteristics as the glaze on a ceramic tile. Ceramic tiles are made from natural clay with a durable glaze; the biscuit of the tile is baked to reduce water content. Next the design is added to the same biscuit before it’s baked again in a kiln at a high temperature. Porcelain tiles are also made from natural clay but of a denser nature, finely ground sand is also added into the manufacturing mix. This mixture is then pressed and fired at a much higher temperature than ceramic tiles, and also for longer to remove almost all of the water content. Choose a tile that’s in keeping with your home, style and lifestyle. You want to choose a tile that’ll stand the test of time, not just in the fashion department but in terms of practicality too. If you’re tiling a conservatory or kitchen, have dogs and children then you’ll want to pick a porcelain tile for extra durability. Renovating a tired bathroom? Pick any tile you love the design of, whether it’s porcelain or ceramic.